Today's recipe is a refreshingly cool drink to beat the heat, Watermleon Lemonade. Here day by day its getting hot & humid and definitely need of some healthy thirst quencher to stay cool & fresh. So me started making some fresh homemade coolants / fruit juices to beat the heat. Watermelon is one such summer fruit contains more water content naturally, high nutritional value, antioxidants, and its a must fruit to include in this hot sunny days. And also eating watermelon helps in reducing weight and the good amount of vitamins helps in eye health also(read it in an article, digital journal). So include this high nutritional summer fruit to stay healthy & fresh. We love all kind of melon fruits particularly the juices made out of them are really so refreshing, juicy and delicious than other fruits. Watermelon lemonade is nothing but a fresh watermelon juice mixed with some sugar syrup/simple syrup and a hint of lemon. When served with crushed ices it tastes so good and refreshing. 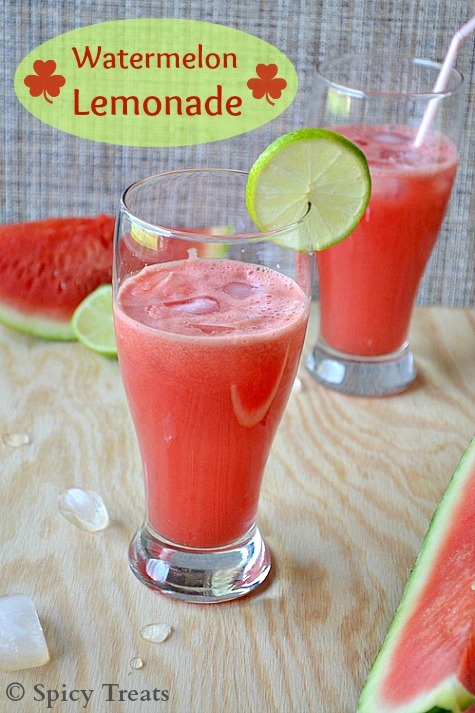 No great preparations involved and its so easy & simple to make this refreshing watermelonade. Cold Water 1 and 1/2 cups or as needed. Bring half cup water to boil then add sugar and stir until sugar dissolves and boil for 3-4 minutes. That's it allow to cool, then pour into a tightly sealed, clean glass jar and store in the refrigerator. The syrup can be refrigerated for up to 2 months or more. Use this simple syrup for all ur fresh juices/lemonade/sparkler etc. Place the watermelon into a blender. And puree until smooth. Then Strain through a fine mesh/mesh strainer. Transfer this to a pitcher/bowl, add lemon juice, simple syrup and cold water stir well to combine and pour into serving glass, top it with ice cubes and garnish with lemon slice or mint leaves and Serve immediately. The simple syrup can be made thin, thick and medium based on the time u let the syrup to boil. more the boil it gets thick. Instead of plain water u can also add sparkling water/club soda for spritzy variation. Colorful and refreshing drink.. Perfect to quench thirst in this hot weather..
Omg, i can have a gallon of this lemonade, highly irresistible and super refreshing. Refreshing and Cool summer food !! Perfect thirst quencher, loved the rich color of Nature.Click well captured. Love this all time.. My most favorite ! That looks super gorgeous. What a lovely color. tempting colour nnice refreshing juice..pics r attracting allot..